The U.S. Hockey Report provides unparalleled recruiting and scouting coverage of the top programs and prospects in youth hockey up through the ranks of USA Hockey, junior hockey, and the NCAA. We are fortunate to count among our subscribers NHL teams, elite DI collegiate programs, NESCAC schools, player agents, families with children playing hockey, and, of course, fans of the game. USHR is truly the Inside Word on Amateur Hockey . In addition to year-round amateur hockey news and scouting reports, USHR provides exclusive coverage of New England Prep Hockey as well as related elite prep hockey teams in the U.S. and Canada. 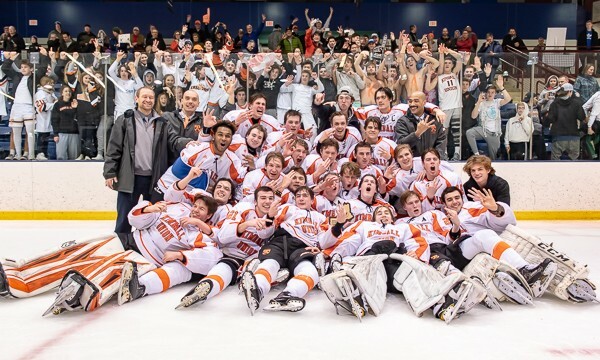 USHR serves as the central repository of New England Prep Hockey team rosters, schedules, box scores, scoring/goaltending stats, aggregated stat leaders, league standings, and power rankings (the latter used to determine NEPSIHA playoff seedings). If you're looking for comprehensive prep hockey coverage, the search is over. Since '97 we've been covering prep hockey, we're the only game in town, period.